This client purchased a brand new home in 1977 when houses were replacing pineapple and sugar cane fields in central Oahu. They loved their 40+-year old home but it was showing signs of its age. Peeling kitchen cabinets, warping floors, difficult-to-clean shutter doors and crumbling popcorn ceilings were some of the indicators that the home they adored needed attention. The family decided that it was time to modernize their residence. The couple worked closely with their Graham Builders’ design team and shared their priorities and visions. Their designer, coordinator and estimator helped the couple to value engineer their project so they were able to attain what they wanted within a comfortable budget. Graham Builders partially removed a wall between the living and dining rooms, creating a great room with increased light and flow. 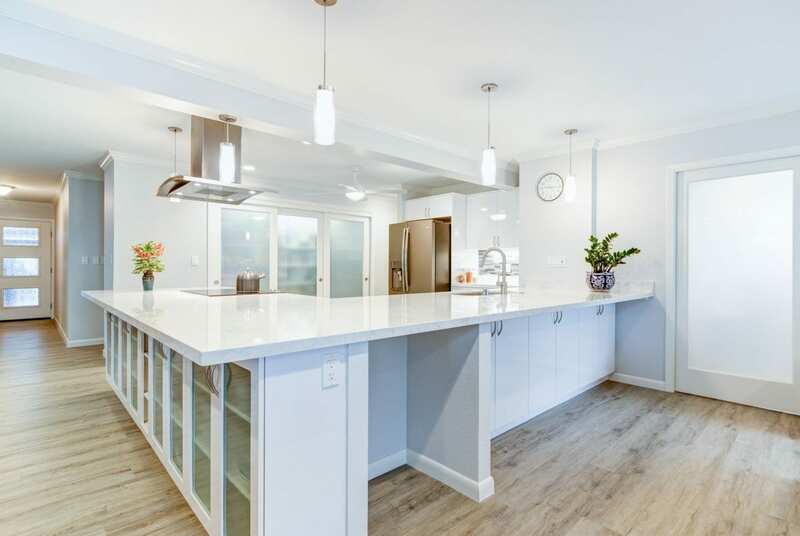 An overhaul of the kitchen resulted in a larger, brighter inviting kitchen that allows the owners to interact with their guests while cooking. 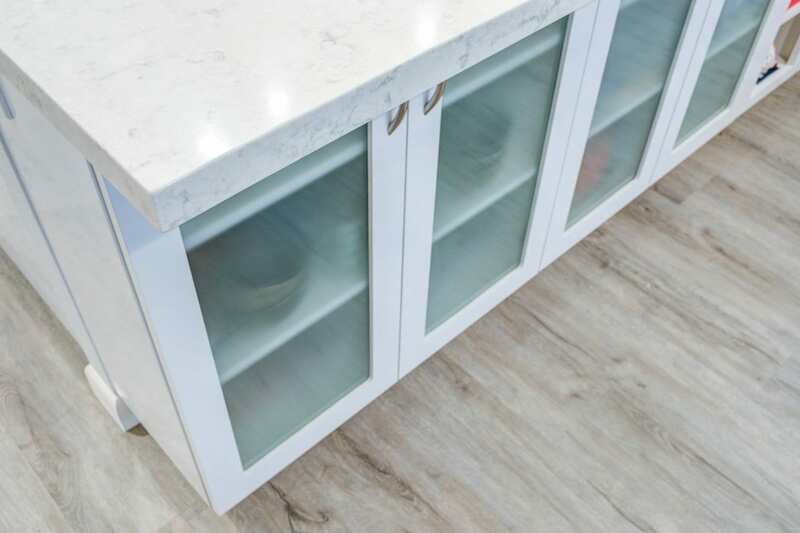 A new massive counter will easily accommodate the largest island-style potluck buffet and the fresh large pantry will store those monthly CostCo runs. 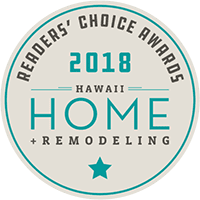 Other homeowner renovation favorites include crown moldings installed after the popcorn ceiling was removed and stunning bathrooms with large mirrors and barn-style shower doors. These views are taken from the enclosed patio area. Notice how the wall has been replaced with a large beam, allowing the kitchen to expand. These photos are taken from inside the kitchen. Note how spacious the kitchen feels without the hanging cabinets, wall and dark walnut cabinets. Taking a step into the kitchen, we can see the vast difference the wall removal made. 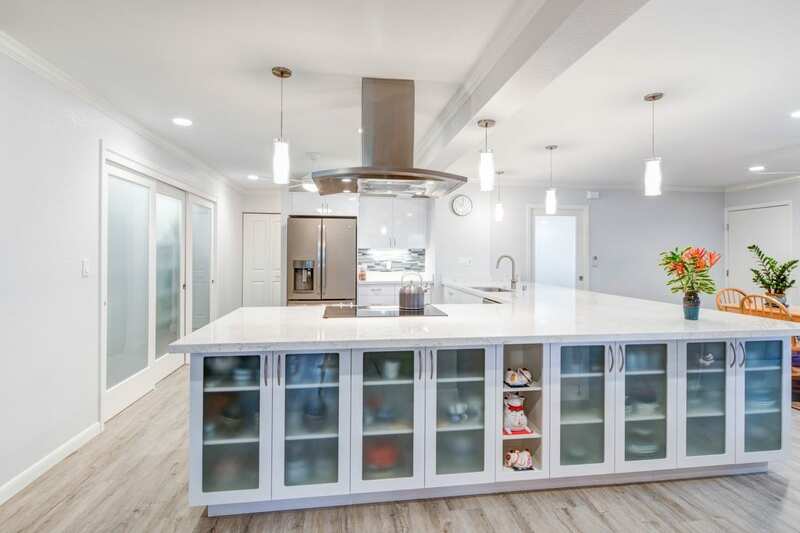 Suspended Sara Grande pendant lights grace over massive LG Hausys quartz counter tops, creating a clean, elegant space. The mixture of white, glass, slate and stainless steel create a bright, expansive feel for this kitchen. 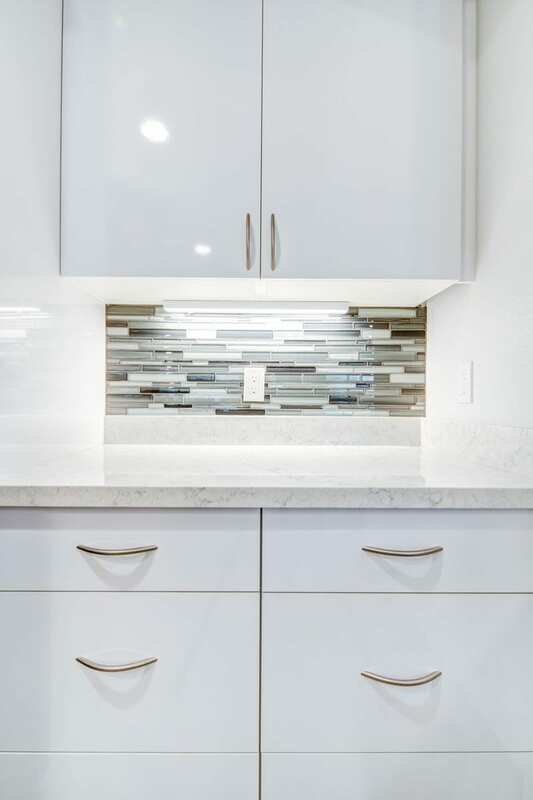 Titanium-hued glass tile adds interest and color to the kitchen. Deep glass-front cabinets allow this homeowner to display her collection of treasures. Two bedrooms are combined into one large suite. One door is removed and sealed. 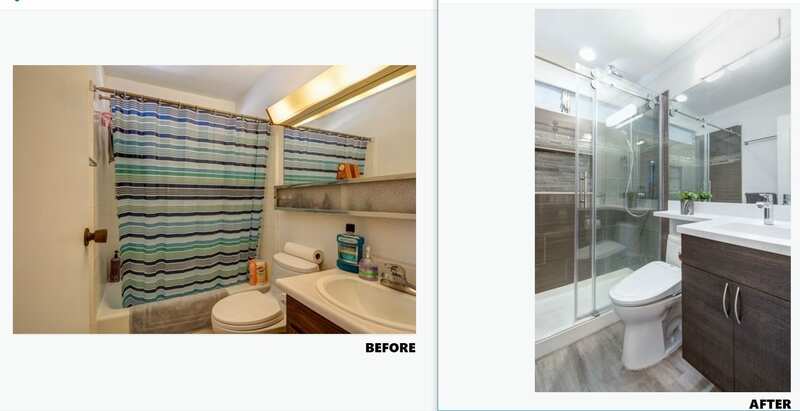 The decades old bathroom is gutted and remodeled into an accessible, modern spa. 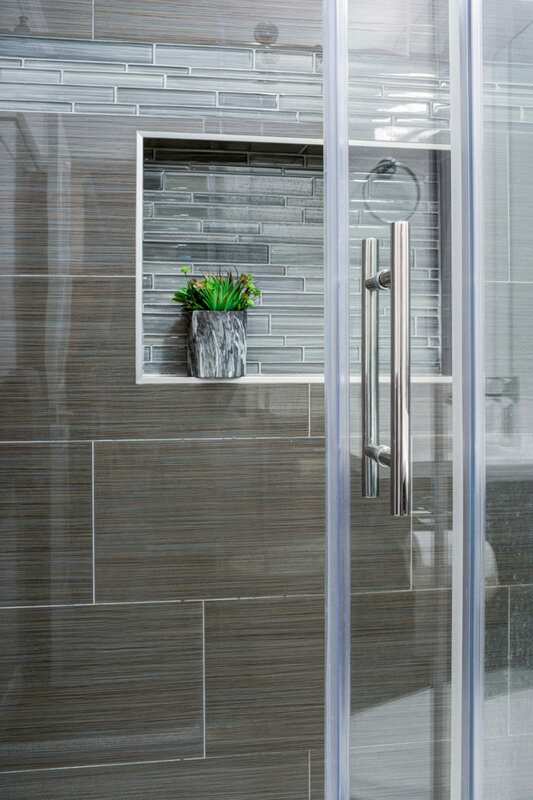 The taupe porcelain tile shower surround is accented with a recessed titanium-hued tile shower niche. 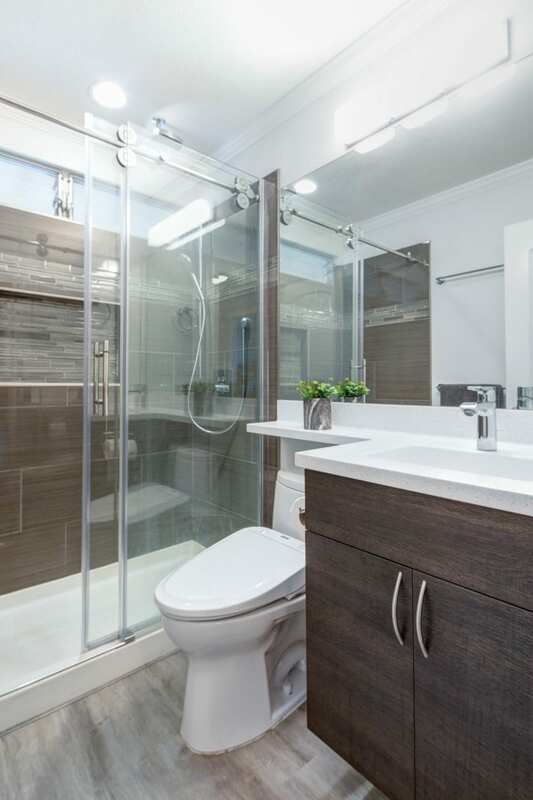 Sliding glass shower barn doors and dark wood cabinets round out this masculine yet elegant bathroom.